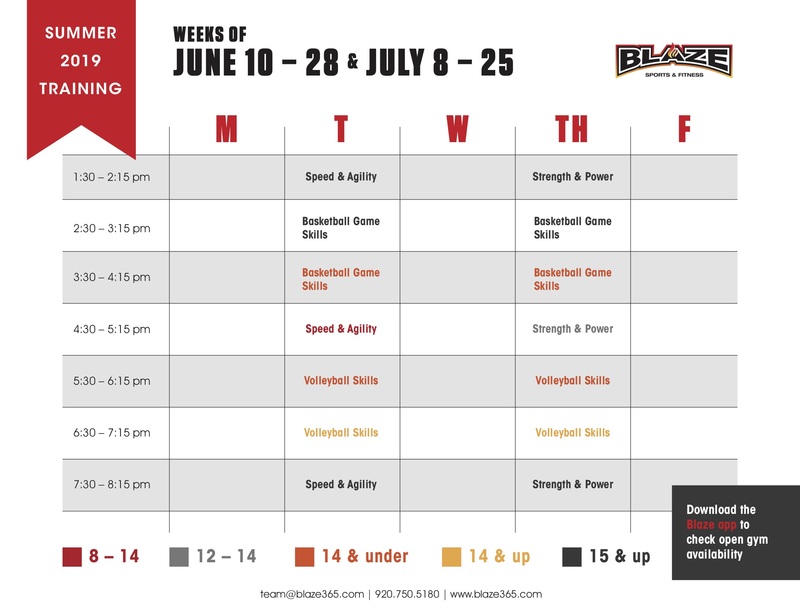 Train to be Your Best with Basketball, Volleyball, Speed & Agility and Power & Strength at Blaze Sports & Fitness! The best way to improve at your sport, is to put in the exrta work in the off-season! Summer is a great time to work on your sport-specific skills as well as improve your speed, strength and flexibility. Our excellent, experienced coaches will help push you to the next level! Blaze Sports & Fitness has everything you need in one place! Our summer training schedule begins the week of June 10th and runs through July 25th. Improve your game with our very talented Basketball Training Specialists. These coaches will drive you to the next level with their creative and intense small group skills sessions. Whether you are a novice or advanced athlete, they will prepare you to make a statement both on and off the court. Take your game to the next level with our very talented Volleyball Training Specialists. Enhance your volleyball skills with solid teaching on the fundamentals to improve your footwork and form. Whether you are a novice or advanced athlete, they will prepare you to perform your best! Volleyball Skills Trainings (45 minutes; 14 & under OR 14 & up) - Click HERE to register! Speed & Agility Trainings (45 minutes; ages 8-14 OR 15 & up) - Click HERE to register! Speed kills and no one understands that better than Blaze Fitness. And that’s why we have created an extremely impactful Speed & Agility program that will have you running and changing directions faster than any competition! The building of muscle memory through dynamic movements and holds will teach your body to respond at high levels. Power & Strength Trainings (45 minutes; ages 12-14 OR 14 & up) - Click HERE to register! Blaze Fitness brings a whole new meaning to strength & power, formulating the basics into awesome concepts to get your body responding in no time! The combining of complex and compound movements are sure to prepare your muscles to take on heavy loads. Whether it’s responding to contact or initiating it as an athlete. Our program embodies quick twitch muscles fibers with explosive movements from the plyometric world. Whether you’re looking for the power to burst through or to elevate above your competition this is the program for you! One on one personal training sessions are also available.